On October 14, 2000, just before midnight, Officer Gerald Silvestri was responding to back up another officer who was contacting a suspected auto thief who reportedly was armed with a gun. As he rushed to the scene, Officer Silvestri hit a bump in the street on Mill Street as he approached Mt. Vernon Avenue and lost control of his car, crashing into a large oak tree. He was rushed to the hospital, where he later died of his injuries. Officer Silvestri was the seventh officer to be killed in the line of duty at San Bernardino Police Department. Officer Silvestri was known for his three great passions — his family, police work and bicycling. He was devoted to his family, and along with his wife, Annie, was very involved in the lives of their kids, Jonathan and Kathryn. His neighbors shared that he was always outside playing with his kids or helping in the neighborhood. He was well liked by his fellow officers; after the crash, the neighborhood in San Bernardino where he was killed set up a memorial on the sidewalk near the crash site. There were candles and handwritten cards from both the community and the officers who served alongside Officer Silvestri, including notes such as the one left by Officer William Outlaw that said, “You will always be in my prayers.” Officer Silvestri often rode 100 to 200 miles per week, and his bicycling buddies will always remember his competitive spirit and lightning-quick sprints. 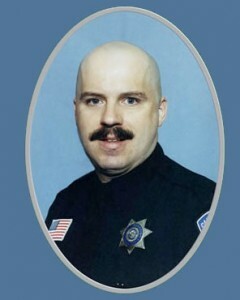 Officer Silvestri was 37 years old when he died.